Oh, Chicago! It’d take a lifetime to know you through’n’through. Details and delights continue to unfold around me on a daily basis. Unnoticed ornament, secret pathsways, hidden spaces… the city’s wonders, charms and quirks are endless. 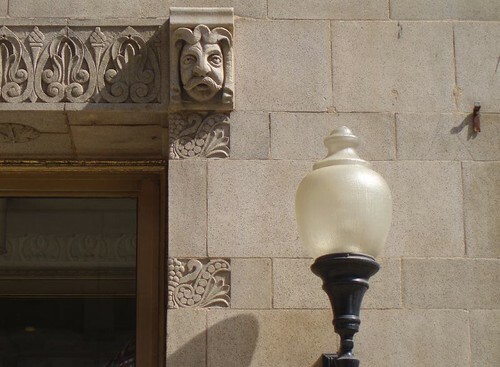 Today I noticed this terra cotta boss on the building at 203 N. Wabash Avenue. With the sun falling just so, he appears to be rolling his eyes in exasperation. He sits on a wall with profuse ornament, floral and geometric designs that make the first three stories of the building a sheer joy to pass by. How many of the city’s rushing workers and scrambling tourists have seen him before me, and how many never took the time to look? Such long contemplation is the luxury of living and working in the core of a great city — the time to absorb the breadth and depth of all its treasures. This entry was posted in Life in Chicago, Terra Cotta, The Loop. Bookmark the permalink.